The latest batch of photographs released this week by the Ottoman Imperial Archives includes several treasures showing historical sites and events in Palestine. 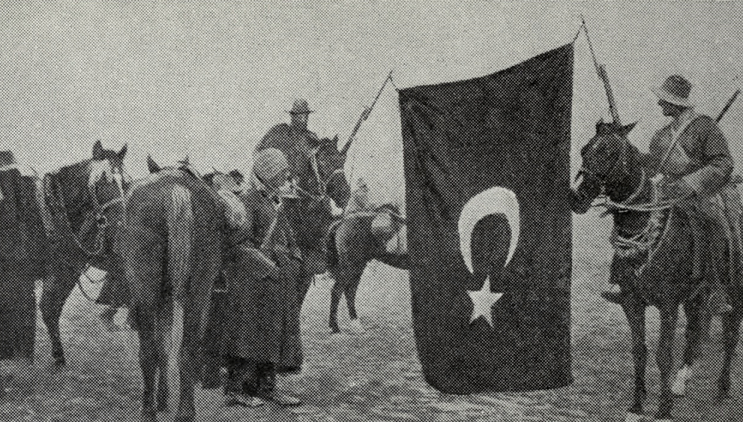 The picture above shows two cavalrymen from the British forces hoisting a Turkish flag on their bayonets. In the past, we featured several pictures found in the Library of Congress (LOC) and Monash University (Australia) archives showing the surrender of Jerusalem to the British forces in December 1917. 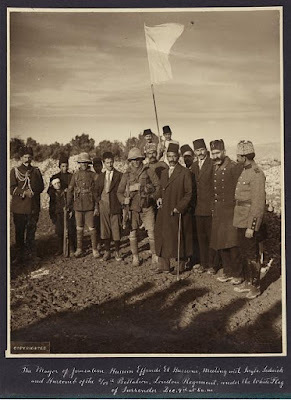 The LOC picture of two British sergeants accepting the surrender flag from Jerusalem officials (not Turkish officers) is one of the most iconic photographs of World War I in Palestine. The picture was taken by a photographer from the American Colony Photo Department; the flag was a sheet take from an American Colony bed. The Monash archives provided a picture of Turkish soldiers hurrying into the Jaffa Gate of Jerusalem's Old City on December 9, 1917, "driven from the outlying hills by our men," the caption reads. From the Old City they continued their retreat toward the Dead Sea. But the photo was not very clear. 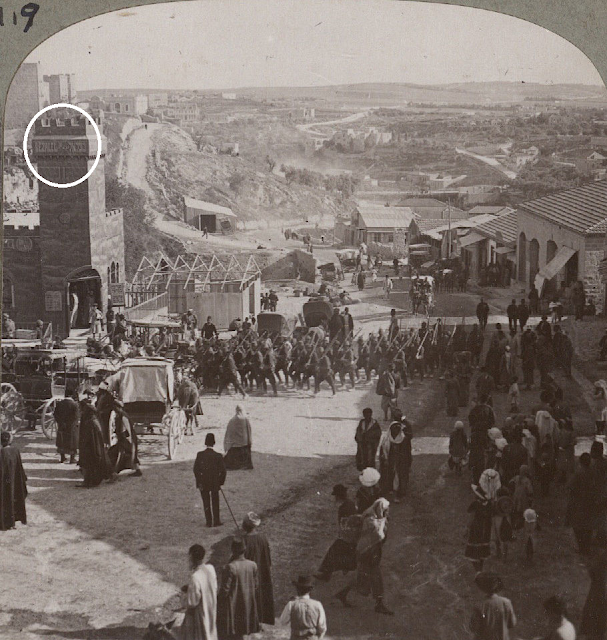 The Ottoman Archives photo below is so clear that viewers can see the writing on the building on the left, "Bezalel" in Hebrew and English. The Bezalel pavilion was built outside of the Jaffa Gate in 1912 to sell souvenirs and crafts made at the Bezalel Academy of Arts. The structure was demolished in 1918 by the British. Turkish retreat from the Jerusalem hillsides on December 9, 1917. The Bezalel Pavilion is on the left.